Claire Clements and her band. 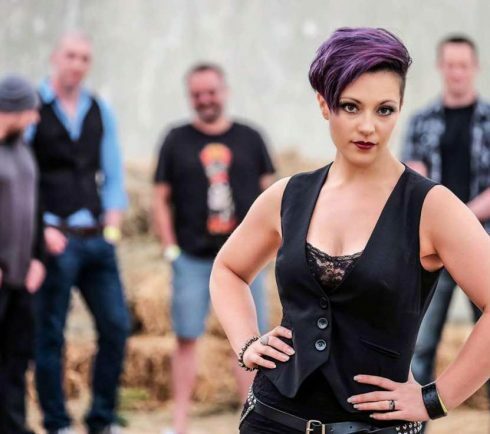 A TALENTED Alcester singer and her rock and blues band are limbering up to do battle for a hot festival date. Claire Clements and Voodoo Stone will be playing their hearts out against three others bands to win a coveted place in the mega August 3-5 Drunken Monkey Rock Festival in Upton-upon-Severn. “We’re very excited about the prospect of getting a Festival slot,” says Claire, who’s supported by Worcester-based lead guitarist Chris Clarke, Liam Blakemore, from Malvern, on bass and Kidderminster drummer Andy Gibson. The quartet, who rock crowds with their own music, will be pitched against Hate.System, Vintage Inc and Ranstone in the May 11 Drunken Monkey Battle of the Bands starting at 7pm at Evesham’s The Valkyrie Bar. It’s a first for the ever-growing Festival which was launched in memory of Ian Downton, who died in 2009 after a car accident. To date, more than £25,000 has been donated to the Midlands Air Ambulance Charity (MAAC). The record-breaking 2017 event attracted twice as many people and raised four times as much as the year before. Tickets are already selling fast for this year’s Festival, with a line up including Wizards of Oz, Pearl Jamm, Van Hailen and Gage, hot footing it from South Africa. Check out www.drunkenmonkeyrockfest.co.uk for the full line up and tickets. The volunteer team of organisers had to turn away scores of would-be performers and the line-up slots are already filling up for next year. But Stu Evans, who runs the main stage, and Chris Harvey, who heads the Tower stage, kept three 2018 places free for the winners of their first Battle of the Bands. Claire and her band can’t wait. “It would be a first for us to play Drunken Monkey, which is a great Festival with a great cause.